Please, don’t miss the cuspidor! 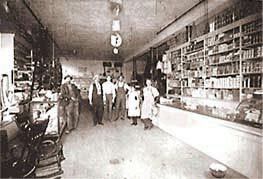 Hodgeden-MacDonald General Merchandise store in the early 1900s. Originally Hodgeden leased the front corner of the building to Larson’s Drygoods. Larson’s moved out to other quarters after about a year, with Hodgeden filling the vacancy with his own establishment later that same year. The general merchandise store shared the front half of the building with the Security Bank, which listed Hodgeden’s partner, James MacDonald as chief financial officer. The bank operated for a few years before closing. The Hodgeden-MacDonald General Merchandise store carried various sundries and supplies and catered to townspeople, lumberjacks and settlers alike. The familiar cuspidor (courtesy vessel for those who chew tobacco) always sat by the front counter. If you were to miss in your aim, you might end up “eating gravel” in the street, after the shopkeeper shouted some experlatives and booted you out the door. It was a crime to “spit tobbaccy” on the sidewalks, too. Irene Hodgeden, Sam’s daughter, took over the store operation and kept things running until shortages during World War II made business difficult to maintain. Next came the National Tea food market which operated in the location until about the mid 1960s. By 1967, BUTLER’S moved from their former location in the old Moveum Theatre building, to their present site in the Aitkin Opera House building and are the current occupant.